How much does it cost to travel to Guilin? How much money will you need in Guilin? ¥135 ($20) is the average daily price for traveling in Guilin. The average price of food for one day is ¥43 ($6.44). The average price of a hotel for a couple is ¥150 ($22). Additional pricing is in the table below. These average travel prices have been collected from other travelers to help you plan your own travel budget. How much money do I need for Guilin? Guilin is a city in Southern China situated on the west bank of the Li River with Hunan to the north. Its name means, "Forest of Sweet Osmanthus," owing to the large number of fragrant Sweet Osmanthus trees located in the city. Products like tea, sugar, and wine, can be made from the tree and are found in many shops throughout Guilin. A popular tourist destination, the city is renowned for its scenery of karst topography with unique mountains jutting out of the urban landscape. With a landscape cut by the winding Li River around jagged mountain scenery, Guilin is most famous for its natural scenery. A cruise along the river brings visitors past displays of karst topography worthy of an art gallery. With stark mountains, traditional villages, bamboo groves, and local farmers at work in the fields, the sights along the river are beautifully picturesque. The mountainous surroundings also make for some of the most mysterious caves, open for visitors to explore a large number of stalactites, stalagmites, and other rock formations. Reed Flute Cave is perhaps the most notable. A natural limestone cave gleaming with multicolored lights, the cave has been a popular attraction for more than a millennium. Yangshuo is a county of Guilin, located about 65 km south of Guilin's center. It is well known for West Street, one of its oldest and most bustling neighborhoods. It is a place where east meets west and cultures collide to create an environment of eclectic activity from souvenir shopping by day to dining by night. The road is completely laid in marble with a simple courtyard-like setting and has opportunities to try flavors from all walks of the world. Attracting more tourists than natives, it is sometimes referred to as the foreigner's street or the global village. A popular local dish of the village is the beer fish. Caught fresh from the Li River and prepared with a delicate sauce it is said to taste great with beer. Some popular cafés include MeiYou Café, Anne's Art Café, and Paris Café. Visually, culturally, and flavorfully, West Street is a neighborhood of the world. Also nearby is Longsheng, known for similar mountain scenery and its beautiful rice terraces carved into the surrounding hills. In addition to cruising by boat along the Li River to take in Guilin's renowned scenery, it is also common to enjoy the region along the Li on foot. Hiking trails along the river offer great opportunities to see the gorgeous Li River scenery and the life of riverside farmers. Nature and wildlife tours are also available for those who prefer a more guided activity. The Lijiang Folk Customs Garden is another popular place to visit in Guilin for an experience of culture, art, folklore, dance, food and beverage, plus beautiful views of the Lijiang River. The park hosts traditional performances of the local culture as well as recreated dwellings from the villages of the indigenous Miao, Yao, Dong and Zhuang peoples. It is a wonderful opportunity to engage in the traditions and culture that have long been established in the region. The Riyue Shuangta Cultural Park is another hot spot of Guilin. It sits as a large leisure park in the heart of the city, with two symbolic towers (Sun Tower and Moon Tower) standing in the middle of Shan Lake. The towers are beautifully lit at night with panoramic views of the city from the top. Other popular attractions of the region include Elephant Trunk Hill, Guilin Yaoshan Mountain Scenic Resort, Guilin Botanical Garden, and Guangxi Guilin Forest Park. Guilin cuisine is known for its small bites and spices, especially chili. The city boasts Three Treasures: Guilin chili sauce, Guilin Sanhua Jiu (a liquor distilled from rice), and Guilin pickled tofu. The chili sauce is used widely in local cooking and consists of fresh chili, garlic, and fermented soybeans. Beyond the Three Treasures, Guilin rice noodles have been a local breakfast staple since the Qin Dynasty, traditionally served with horse meat, though you can have without as well. Another popular dish in Guilin is zongzia dumpling made from glutinous rice and mung bean paste wrapped in a bamboo or banana leaf. Any of these dishes, characterized by a subtle sweetness and delicate use of spices, can be found just about anywhere in the city. Most eateries are located on Binjiang Road, Jiefang West Street, Putuo Road, Meishi Cheng (Cate City, left of the bus station), and Zhishan Road with a popular one located near the bell tower in the Center Square. The main airport of the area is Guilin Liangjiang International Airport. It is located in Liangjiang and offers both domestic and international flights. By train, Guilin Main Train Station and Guilin North Train Station are on the HunanGuangxi Railway and GuiyangGuangzhou High-Speed Railway, which are the main railways connecting Guangxi with central and southern China. High-speed trains are available at North Station between Guilin and Guangzhou, Shenzhen, Changsha, Guiyang, Shanghai, and Beijing. Public transportation is available by taxi and double-decker bus, as well as on sightseeing boats on the city's canals and lakes. 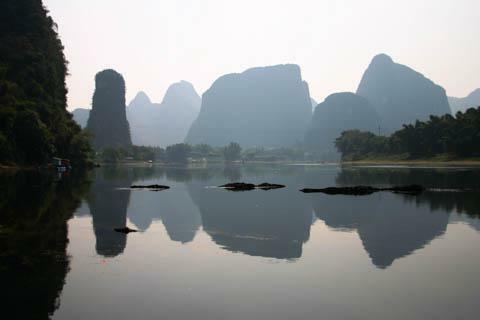 Guilin is a fascinating city, with a lake and some great temples to visit. It's worth sending a day or two here, but if you're pressed for time consider heading on to the more scenic town of Yangzhou. It is more beautifully positioned among the steep peaks and the town itself has a better vibe. It's also cheaper to stay in Yangzhou than Guilin because accommodations are more plentiful. You can easily travel between the two by bus. If you flew in to Guilin, hang out a day or two, then head on to Yangzhou.